Update: the codes are all gone! Thanks to all who entered. 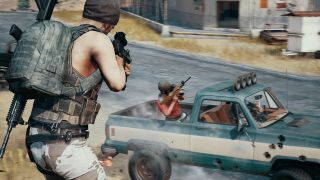 The Sanhok map is live and PUBG players are battling for chicken dinners in huge numbers. To celebrate, we're giving away 1000 Event Passes that will speed up your levelling and access to more cosmetic items. To be precise all Premium and Free pass items can be earned, all missions are accessible and you earn 2 XP per minute you survive (to a daily maximum of 180) XP). On top of that you get a BP boost of between 5 and 20 percent. The event pass naturally has a Sanhok theme, so expect Sanhok-specific missions alongside daily and weekly missions. The event concludes on July 21. To grab a key simply enter your email address into the widget below. The first 1000 will receive a key once the email has been verified. Enter the key in the 'activate a product on Steam' section of your Steam client to redeem. Terms and conditions apply, as they say. Good luck!